Prior to the 9/11 Ceremony yesterday we were able to catch the Marathon Team in a group photo. The Marathon Team is a competitive group of runners at the Air Force Academy that participate in various road and trail races throughout the state and country. Many of the Cadets are prior cross country runners from their high school days and they wanted to find a way to continue to run with a team during their time at the Academy. The team also brings in many new runners every year that have minimal experience with racing but want the opportunity to get better at running and join a tight-knit team. 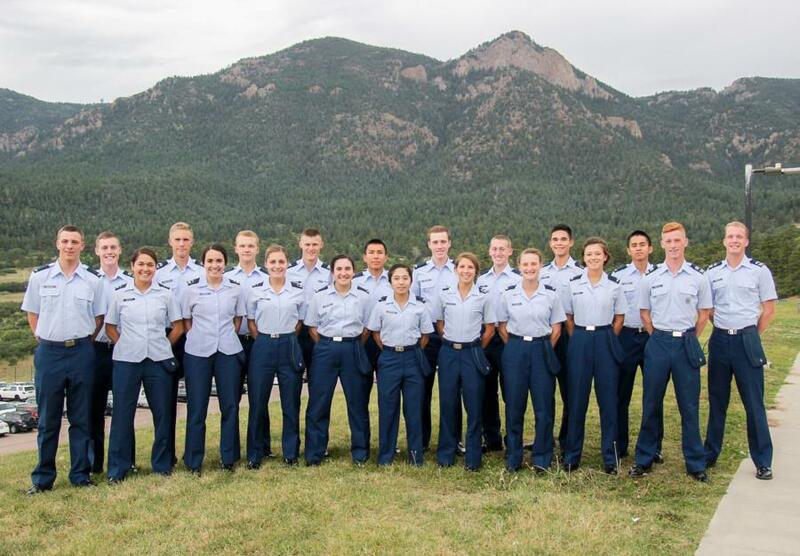 Every year the Marathon team runs the Colorado Marathon and from that race they have many cadets that are able to qualify for the Boston Marathon. They will be sending 12 cadets from the current team to run the Boston Marathon in 2018! In addition to the Boston and Colorado Marathon, the team is hoping to be able to represent USAFA at the AF Marathon in September and the Marine Corps Marathon in October. They also participate in more local training races that range from 10ks to half marathons! The team's training is year round despite Colorado's crazy weather. "As a team we love pushing each other to get better and we hope that we represent USAFA well at all of our races and events!" We are looking forward to getting more coverage of the Marathon Team as the academic year progresses! To view our glimpse of the Marathon Team go to, Galleries - Extracurricular - Cadet Clubs. Or click the link below.